The Pacific jacksmelt is neither a jack nor a smelt. It's the largest silverside fish in the Pacific, and it is one of the most commonly caught fish off docks, piers, and jetties in that ocean. The jacksmelt (Atherinopsis californiensis) is also known as horse smelt, blue smelt, or California smelt. They appear from Baja to Oregon and are typically 9 to 15 inches long. They have torpedo-shaped bodies and beautiful electric blue stripes on their backs. 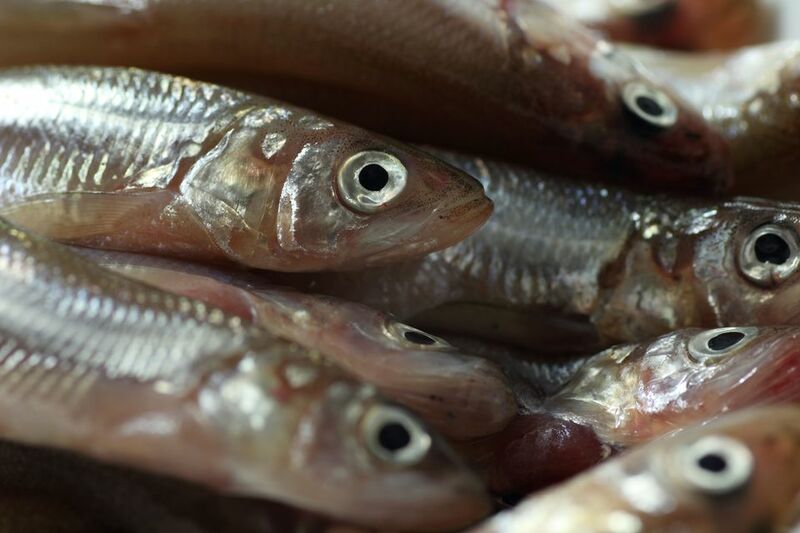 While there was once a commercial fishery for them, now you may only find jacksmelt in Asian markets, if at all. However, they are ridiculously easy to catch off piers because they like to school in shallow water less than 100 feet deep. Some light tackle and little bits of shrimp, or even shiny bare hooks, should do the trick. Once you have your jacksmelt catch, the finest fate for the fish is to hot-smoke it like a teeny salmon. They are oily and full-flavored, so the smoke and brine really do this fish justice. If you prefer not to smoke them, jacksmelt are also be excellent when split, scaled, gutted, and stuffed with herbs and mushrooms. Wrap them in a grape leaf and grill them over charcoal for a delicious entree. You could also fillet the fish and make a fine escabeche. This is a simple Spanish preparation in which you cook the fish then marinate it in a vinegary sauce for a day before eating. Think of it like a quick fish pickle. One thing you should not do with jacksmelt is eaten them raw. A few may contain tiny parasites, but these are killed by proper cooking. The parasites look like tiny coiled worms and they're not in every fish. You might find one in a dozen fish. Simply remove the worm and cook and eat the fish along with the other fillets. Don't let the possibility of parasites ruin a day at the pier, either. Many, many fish (not to mention beef, chicken, and pork) contain them. As the California Department of Fish and Wildlife notes, "they're harmless to humans when the fish is thoroughly cooked." Simply cook the fish well and you are good to go. California Department of Fish and Wildlife. California Marine Sportfish Identification: Other Fishes. 2013. How Can You Learn to Cook Irresistible Sockeye Salmon? What Is Calamari and How Is It Cooked?